Which finish is best for carbon rims and what's the difference? If you are not much familiar with the glossy and matte finish for carbon fiber rims, then it is the time to boost up your knowledge a bit. Both glossy and matte are the type of finishes provided to the carbon fiber bicycle rims. 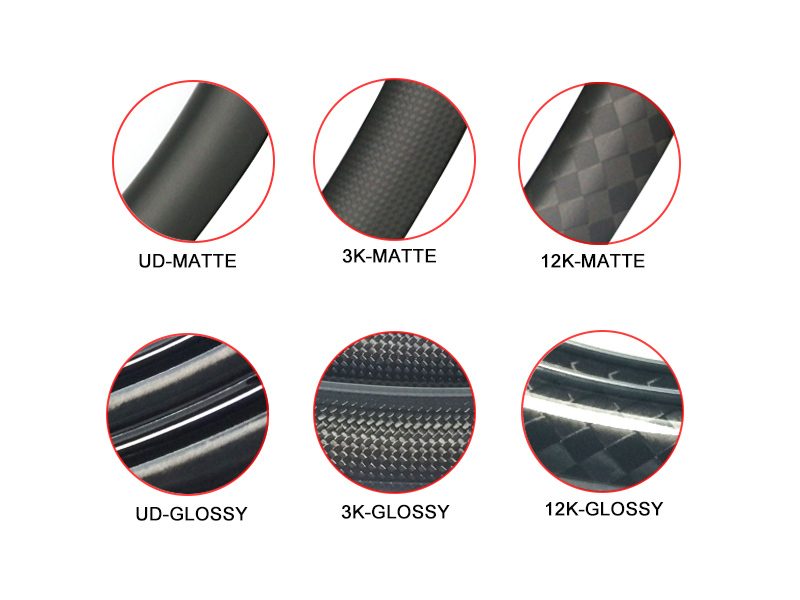 In addition to the appearance UD / 3K / 12K, there is usually an option to choose between matte finish and glossy finish for carbon rims. What's the difference between matte and glossy finish? A totally flat finish with no sheen or reflective properties, matte results in more stealthy look. This is the most popular options for carbon rims. The glossy finish is shiny. The glossy finish offers a greater sheen. When your carbon rims are used for a period of time or over a year, the advantages and disadvantages are more obvious. Both kinds of finishes have their own advantages and disadvantages. Gloss finish is shiny and vibrant. Matte finish is less shiny and may look dull in color. Gloss finish is more susceptible to smudges. BTLOS offers satin finish or custom finish for carbon rims also. The semi-gloss(satin finish) looks that is the perfect compromise between glossy and matte. The differences in between glossy finish and matte finish can vary according to your personal choice and requirements. Whether you choose glossy finish or matte finish, it’s really up to you.